Pearl Izumi's Elite Softshell MTB Shoe Covers 2018 are durably-made mountain bike shoe covers designed to fit over treaded MTB shoes. 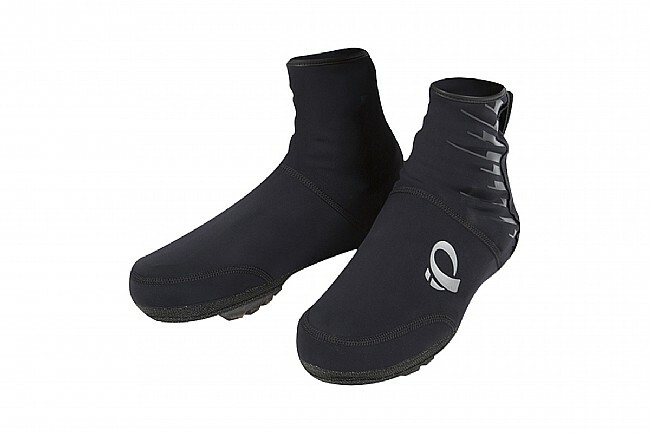 These shoe covers provide insulated wind and water protection from cold and damp weather conditions. The two stage hook and loop closure system ensures a custom fit by allowing adjustment both behind the heel and at the ankle. It also makes it easy to get the shoe covers on and off. The Power Band anchors the front of the shoe cover beneath the toes so it stays firmly in place. Power band front-of-shoe anchoring design. Two stage hook and loop closure. Temp. Range: 30° to 45°F. I've worn these on rides down into the upper 30's and am quite pleased with them. These are warmer than my last pair, but not quite as warm as a fleece-lined pair I also own. My wife gave me a different pair made from a different material in large and they were too small for my size ten shoes, so I got these instead in an extra large. It this model the large would have been fine. I like the new closure system, it's much better than fighting with zippers.